Look out for Carlo Rovelli's next book, Reality Is Not What It Seems. 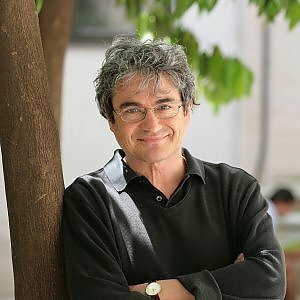 Carlo Rovelli was born in Italy, is a US citizen and lives in France. His main activity is in theoretical physics, where he is known as one of the founders of loop quantum gravity. He has also interests in the history and philosophy of science. He has written "Quantum Gravity", a treatise on loop quantum gravity and, for the large public, "The First Scientist: Anaximander and his Legacy", which is primarily a reflection on the nature of science. The book is translated in five languages and has been awarded by the "Prix du Livre Haute Maurienne". Rovelli has worked in various Universities in Italy, the US and France. He is currently head of the quantum gravity group at the Center For Theoretical Physics of the Aix-Marseille University. He is Honorary Professor of the Normal University of Beijing, and member of the International Academy for the Philosophy of Science.